One of my favourite things about winter is the clothes of the season. I especially love winter coats; there's just something about bundling up in a good coat with sharp details that makes me just that much more willing to head out the door on a chilly morning. (It might also help that I like the cold a little more than your average person.) It's been cold enough to warrant using a coat for most of November now, which is a big change from any other winter I've seen, even when I lived in England before! One problem I have, as it were, is that I'm always looking for a new coat to add to my wardrobe, even when I already have several. 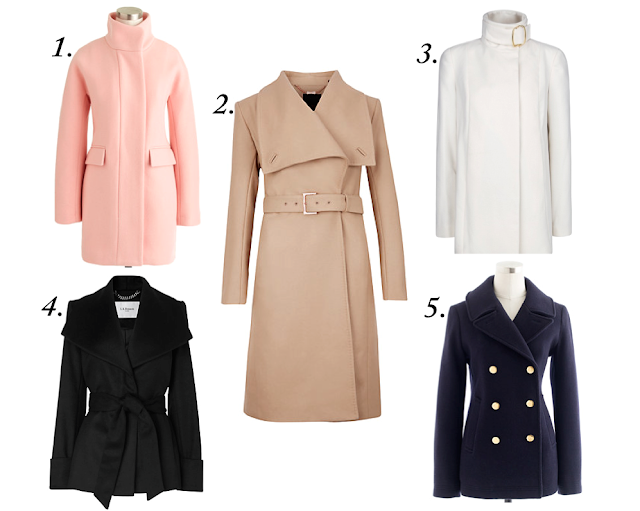 Here are a few I would love to add to my collection this season in all sorts of colours and styles, plus a perennial favourite, the majesty peacoat, which I already own and absolutely adore. I especially love the black and camel coats because I don't own a belted coat, and I would love to change that! What are your favourite coats for winter?